How Are Parish Pastoral Councils And Assemblies Formed? There are three important stages involved in establishing a parish leadership group within a given community: The Steering Group, The Nomination Process and finally, The Formation Programme. What is a Steering Group? The vast majority of parishes in Cork & Ross already have a Parish Pastoral Council or a Parish Pastoral Assembly well established in their community. The journey towards establishing a parish pastoral council or assembly begins with local clergy inviting a small group of 5 to 10 parishioners to gather over a period of time to reflect together on what particular model of partnership might best serve the needs of the parish and how a leadership group that is truly representation of the whole parish might emerge. a mix of male and female parishioners of different age groups. people who are interested in the parish and in its future. people who have a good knowledge of the parish. 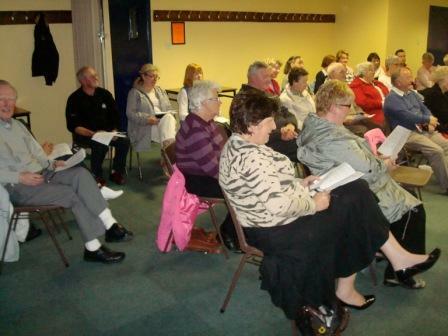 parishioners who are willing to listen to the ideas and needs of the wider community. people who are willing to invest time reflecting on a renewed vision of the church as the people of God and promoting this spirit of shared responsibility within the wider community. What does the Steering Group do? Once established the steering group gathers together over a period of time to reflect together on what it means to say that the Church is “the people of God.” Together they seek to discern how such a spirit of partnership might be fostered in the parish to better allow parishioners and clergy to work together in addressing the needs of the community. The steering group reflects together, with the support of personnel from the Pastoral Development Office, on what particular model of partnership might best serve their parish and how a leadership group that is truly representative of the whole parish can emerge. The steering group helps to promote the idea of partnership within the wider community and helps parishioners to understand what it means for a parish to have a parish pastoral council or parish pastoral assembly. The steering group decides on, sets up and oversees the process by which parishioners are nominated to the Parish Pastoral Assembly or the Parish Pastoral Council. The nomination process aims to be as inclusive as possible and seeks to ensure the leadership group that emerges is as representative as possible of the wider parish community in terms of age, gender, parish areas, etc. It is up to each parish to decide on how this can best be achieved given the particular nature of the parish. Once the nomination process is complete the important service offered by the Steering Group comes to an end and they hand over responsibility to the newly nominated council or assembly. Those who have been nominated to the parish pastoral council or assembly are invited to attend a three night training programme facilitated locally in the parish by personnel from the Pastoral Development Office. These formation nights focus on our understanding of church and parish, clarify the role of the pastoral council or pastoral assembly within the parish and explore ways in which we might work more cohesively and effectively together in a spirit of faith and partnership. The formation nights are typically held one night a week over three successive weeks. Those who accept the parish’s invitation to become a member of the Parish Pastoral Council or Assembly also take part in a planning day facilitated by the Pastoral Development Office where the group explores which aspects of parish life they want to focus on and how they might organise themselves to achieve this. Once the formation programme and the planning day are completed, the new pastoral council or assembly is publicly commissioned, usually during the celebration of Sunday Mass within the parish, and begin their time of service and serve a three year term. They continue to be supported throughout that time by the Pastoral Development Office and the other pastoral resources of the dioceses. What is the RCIA ?